Sea freight quotation between agency and liner could not be easy. It is highly demandable and takes many iterations to get an approval. 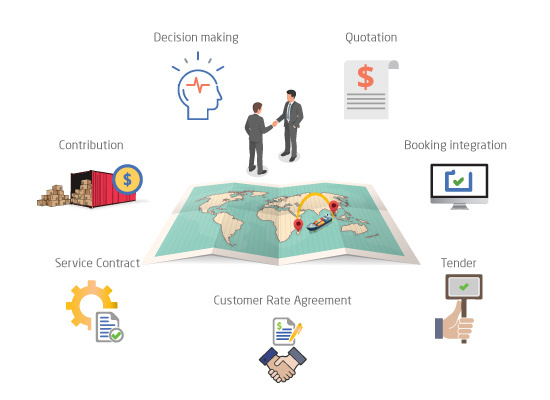 Shipping industry needs a seamless integrated solution to process the quotations before a booking is made. SVM RR (Rate Request) is a modular system that helps the pricing team to get a quotation for both standard and conditional surcharges based on business demand. The Modular system that facilitates Approved quotation seamlessly merges with an efficient booking system. It is a scalable and adaptable to any organization no matter what the size. An intelligent built-in mechanism ensures that rate trends are in line with market trends and ensures rate integrity, driving global pricing policies capable of tracking market trends.